January main contents: Growing anything well is about care and attention to detail..... There's always lots of healthy food in a well-planted polytunnel.....One of the commonest complaints I hear is "my children won't eat vegetables"!.....Time to plant some 'extra early ' potatoes in pots in mid January.....Use it or lose it! Making use of every inch of soil is what Nature does!.....Rotational thinking.....Don't have empty, uncovered ground now either outside or in the tunnel.....Get your worms working for you! Whether you're growing livestock or plants it's no different in that respect. My Polytunnel Potager is currently growing meat, eggs and more than two veg! I hope you'll forgive that dreadful pun - but this winter I decided to raise some of my own chickens and laying hens from day old chicks once again - a bit earlier than normal though, as I usually would do that in the middle of March if I need replacement laying hens, as I mentioned last month - where I also explained the reason why I was rearing both laying hens and chickens for meat together, which is unusual with hybrid hens reared for commercial flocks, but which I decided to try doing for ethical reasons: http://nickykylegardening.com/index.php/blog/595-the-polytunnel-and-greenhouse-in-december-2018. Normally if one keeps backyard poultry, they are often raised by a mother hen probably from her own fertilised eggs, and would all grow up together naturally. But I can no longer keep poultry unprotected in the yard here due to a problem with foxes - encouraged by rubbish dumped in our roadside ditches from local takeaways! The other problem is that pure breed hens don't lay enough eggs for us all year round either - so hence I decided to rear my own. The supersize duplex dog crates which provides their temporary nursery in the polytunnel, are pretty well-insulated with all the bubble wrap and cardboard which I never throw away as it's so useful - but there is still a very small amount of residual heat on top, which keeps that area just frost-free, so I decided to "kill two birds with one stone" (sorry!) - so to speak and sow some veg a month earlier than usual on the 12th of December to be exact. I'm really delighted with how they've done and the quality of them - and although a stretching for light or 'etiolated' a little more than usual due to the lowest midwinter light - they are growing on really well and none have 'damped off' with disease despite being multi-sown so early in modules. I put that down to the wonderful Klassman organic seed compost which is perfect for seedlings - providing a far more natural growing environment than any peat compost with added chemicals ever possibly could! Providing a dry surrounding atmosphere for seedlings also helps to avoid damping off, something that people often forget when raising them in very humid propagators. Growing anything well is all about care and attention to detail - and rearing chickens for eating and hens for laying requires even more than plants - but they are so worth it. They need checking every couple of hours through the day for the first few weeks, especially in the first few days when they are little more than tiny scraps of fluff! If well looked-after though they grow astonishingly fast. This lot really seem to have grown even faster than usual and have clearly enjoyed the shelter in the polytunnel with all the green food they starting to eat now. Now almost 5 weeks old - in another 2 weeks or so they will have outgrown their nursery run area on one of the raised beds where they're learning to forage, finding their first worms and beetles. Soon they'll be really well-feathered and ready to go outside for even more adventures! Although at times a self-sufficient life can be time-consuming - it is very rewarding and something I've always done. I could never get food more local, seasonal or organic than what I grow in my own back yard! That's what a real potager is all about - it's not a purely ornamental garden like a parterre which looks perfectly-groomed all year round, it's really a French name for a decorative, but all mixed up cottage or artisan-type garden that produces food and flowers for the household all year round. 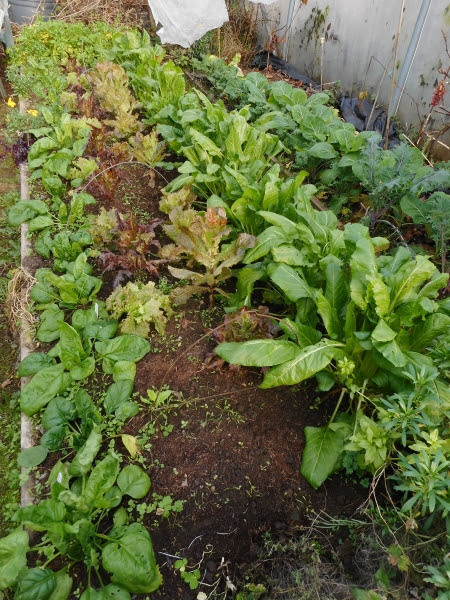 Above is a New Year's Day picture of my main beds showing the wide range of winter crops available. My polytunnel potager isn't a show garden - it is never 'prepared' to be photographed specially for the website or for a magazine. I like people to see that it's a genuinely REAL garden, weeds warts and all - gardened by a person who lives a very busy REAL life! It can often even look quite scruffy - but I really think it can put people off gardening if they think everything always has to be pristine and perfect. Nature doesn't do tidy and pristine - although for me it's always perfect! Apart from growing most of my own food - I'm also a writer and recipe developer - always experimenting and inventing new ways of cooking the real foods which I grow (which my family certainly seem to appreciate!). I'm an occasional portrait sculptor too when I have tim - if I'm asked to do an interesting commission. (That's probably just another slightly different way of getting my hands dirty while working with clay really - something that I've always loved ever since childhood, having been brought up in a garden on heavy clay, where making small pots is one of my earliest memories of working with soil!) Anyway - as a result of leading a very busy life - one of the best things about having a polytunnel for me is that it allows me to work whenever I have the time. I'm not restricted by the weather, because the soil is always in exactly the condition that I want it to be and as I also have an electricity supply there - so I could even work in the dark if I really wanted to - but rarely do anything other than dash out to cover something with fleece after dark, if the late weather forecast suddenly changes and predicts frost!! I try to make my polytunnel as near as possible a microcosm of the things that you would naturally find in an outside garden - just undercover - with the same diversity and balanced ecology that you would find in any organic garden. I try to have as wide variety as possible of healthy, chemical-free food and flowers not just for us but also for the vital diversity of wildlife like bees, butterflies, birds, frogs etc that help to do Nature's work all year round. As a result - it produces plenty of organic, peat-free, REAL food in every month of the year - not just in summer - without using any chemical pesticides whatsoever - even any of the natural ones that may be allowed under some organic certification. Over the last 40 years or so I've always found that observing how Nature grows things and trying to mimic those conditions as far as possible, is the best way to grow food that is healthier for us and the environment. I've never needed to use any sprays at all - even the garlic ones I see so often advised by some gardeners. Nature doesn't spray things with garlic!! It doesn't add anything to soil but plant remains - with occasional accidental fertilisation from animals. Obviously if we take crops from soil we have to replace any nutrients we take away by using compost - but it seems to me that often the hardest thing for so many people who are starting to learn about organic gardening is just accepting that Nature actually knows best - not man! People have been so completely brainwashed into thinking that a spray or a quick fix is needed for everything immediately they see it - that they often don't have the patience to just wait and trust that Nature will deal with pest problems - given a healthy soil and the right conditions for her predatory army! The polytunnel helps us to be self-sufficient in a wide variety of not just winter salads but also other crops - such as chards, chicory, calabrese, watercress, kales, spinach and herbs like parsley which can be picked daily, despite the cold temperatures. This is the time of year when a polytunnel really proves it's worth - quite apart from the fabulous summer crops it obviously grows. Looking around the shops at the moment - they are almost completely empty of any decent organic vegetables apart from root crops - not just because it's the New Year but also because of the dreadful weather throughout Europe and further afield, where increasingly, many of the imported organic crops that supermarkets sell are now grown. 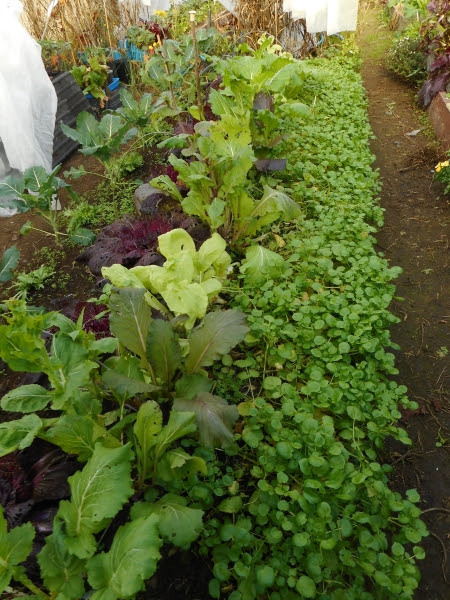 Although many of the winter crops I grow could in theory be produced outside in our vegetable garden - they are much more reliable in a polytunnel and consistently produce far bigger crops, due to the protection from the elements like storms and very heavy rain. Unfortunately these weather conditions are an increasing problem due to the unpredictable weather patterns that are happening more frequently due to climate change. Why do I insist on growing peat-free compost is something people often ask? Apart from the fact that none of the major vegetable crops we eat actually evolved to grow in peat - using peat destroys peat bogs which are vitally important carbon sinks and host valuable biodiversity. Extracting peat from them releases millions of years of stored carbon - which rapidly accelerates climate change! The rise in peat use originally coincided with the rise in container-grown plants being sold in garden centres and online nurseries etc. because it's much lighter than soil. As it's easier to handle than soil based composts - it facilitates the horticulture industry, who are reluctant to stop using it - despite the huge amount of scientific evidence that doing so is incredible damaging for the environment, causing not just carbon release but also pollution and flooding. The only crops that humans ea, which evolved to grow in the naturally acid conditions of peat bogs, are some fruits like blueberries and cranberries, that like a low soil pH. Being an unnatural medium for most crops - the sterile peat needs chemical fertilisers added to feed the plants. This then of course means that plants are unhealthy, because peat composts don't provide the additional natural soil diversity that plants need in order to produce the compounds which protect them from pests and diseases. This has the predictable result that the nonsensical and biodiversity-damaging chemical merry-go-round continues....with gardeners then using chemical sprays to get rid of the pests and diseases that the poor plants couldn't deal with! Apart from all those very good reasons why I love my organic, very biodiverse polytunnel - it's really also my personal Narnia. It's a natural space where in winter, when things are a bit more slow and relaxed, I can enjoy just sitting or pottering, observing nature and getting my hands dirty! Somewhere where I can plug into the soil no matter what the weather and where I'm actually earthing myself - which again science is beginning to prove is so important for our mental health - especially if the soil is full of a healthy diversity of microbes and mycorrhizal fungi (did we really need scientists to tell us that?). It's also often a place where I'm also just peacefully thinking - and so often germinating and planting ideas is something that is just as important as sowing or planting plants! Our Midwinter From Tunnel to Table was fun as usual! Gerry Kelly & I enjoyed recording our midwinter Solstice edition of 'From Tunnel to Table' once again! Our Christmas special 'From Tunnel to Table' special was great fun as usual! The fairy lights twinkling in the deepening gloom of late afternoon dusk on the solstice eve, 21st December looked very festive, the reindeer headbands I insisted we wore looked suitably silly and the new recipe was a real winner with everyone - especially Gerry - who is always such an appreciative eater! If you missed it you can hear the podcast on the 'listen' button. It's only a couple of weeks since then - but already the days seem to have stretched just the tiniest bit, on the couple of lovely bright but frosty days we've had recently. This week was the 10th birthday celebration of The Late Lunch show on LMFM Radio and I can't believe that our From Tunnel to Table feature is 5 years old now! I'd done a couple of interviews with Gerry before that for various reasons - but I must say the last 5 years have been such fun! Gerry has been so patient and all of his crew so kind to a radio 'newbie'! 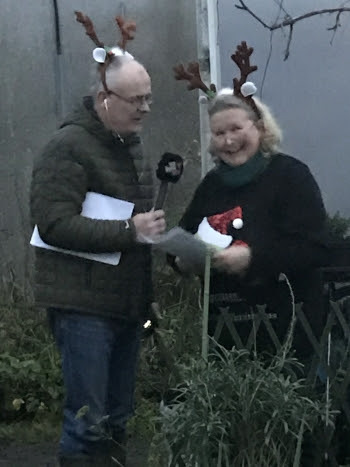 We all enjoyed a lovely party as the show was broadcast live from Bellingham Castle Hotel in Castlebellingham, County Louth - and a great deal of fun was had by all! 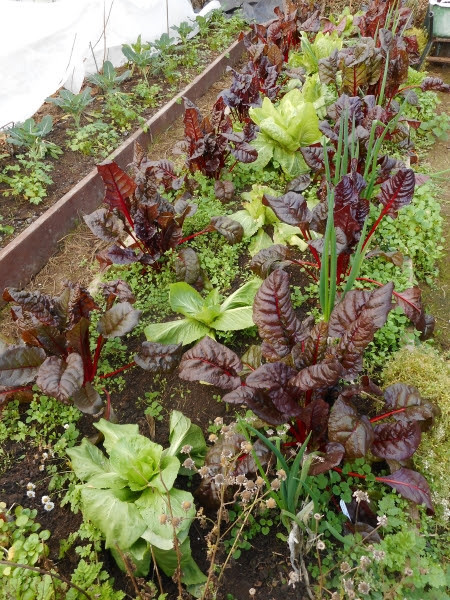 Whatever the weather - there's always lots of healthy food in a well-planted polytunnel - especially winter salads! I look forward to picking a different salad for lunch every day no matter what the time of year. The content varies depending on what I happen feel like - I go out into the tunnel or garden and just sort of 'dowse' instinctively. Watercress is always one of my favourites. It's so versatile and hardy, grows like mad even in winter and takes only two minutes to pick a few of the abundant tender shoot tips for all manner of fast and delicious dishes. Picking the shoot tips along with the first 2 or 3 leaf joints and leaves is the secret of keeping it producing well for months. This prevents it from flowering and keeps it making succulent new side shoots, as long as you keep the soil it's growing in fairly damp too. It gets a really good 'haircut' every so often all around the edges of the bed as it starts to grow out very enthusiastically into the paths. It makes a delicious soup if you have plenty - especially accompanied by some home-made crusty wholemeal spelt bread. (Soup recipe in that section of blog). It's great tossed into just cooked pasta along with blue cheese or anything else you fancy, in my low carb wraps (again in the recipe section) or just as it is in all sorts of salads. It also freezes very well - so you can have it for sauces and soups all year round. It's so expensive to buy in shops if you can get it - and even when you can find it - it's often 3 days old and already going slimy! It's as easy as falling off a log to grow from seed, or cuttings, and is happy all year round in a damp shady spot in the tunnel, or outside under cloches even in winter. That's a spot where very few crops will grow well. There's just nothing like those juicy, fresh green shoots of the watercress and all the other salads, urgently pushing up towards the light, to rekindle that eternal gardener's optimism at this time of year. There's also nothing like them to keep winter colds at bay either! Just now I'm looking forward to yet another lunch of the Organic Blue cheese, pear and watercress salad that I did for our Tunnel to Table programme - I just can't get enough of it at the moment and eat it almost every day as it's so delicious and nutritious! The peppery nutrient-rich leaves of watercress combine so well with anything though - and my walnut, avocado oil, cider vinegar and honey dressing is the perfect complement drizzled over it! Watercress is so easy, yummy and chock-full of healthy, cancer-fighting phytochemicals! Watercress is a truly perennial herb. In the summer when the polytunnel would be too hot for it - I pull up a few roots to grow outside in a shady damp spot - then in the autumn I just take cuttings of those to plant again in a new spot in the polytunnel. Remember if you grow it though - that it's a member of the brassica family and must go in that section of your rotation, wherever you grow it. The only pest that attacks it is the cabbage white butterfly - whose eggs are hard to spot on watercress and one often doesn't notice them until the entire plant has been defoliated! So keeping it covered with netting in summer will prevent this and also give it a bit more of the shade it appreciates. One of the commonest complaints I hear is "my children won't eat vegetables"
Well in my experience children tend to follow by example - so they will generally eat whatever you eat! That's why it's really important that they see their parents enjoying a wide variety of vegetables every day! Our meals have always consisted of at least three quarters vegetables and I never had a problem with my kids eating any veg. My daughter had a lot of allergies from birth, so from experience was rightly cautious, if not sometimes downright suspicious, of almost anything new. If I produced anything she hadn't encountered before - the reaction would most often be an automatic and emphatic "NO". So I discovered that a bit of reverse psychology worked well there! To the suspicious "What's THAT?" from her - I would just offhandedly reply - "Oh - that's not for children it's only for the grown-ups!" whereupon she would demand whatever it was immediately or threaten a tantrum!! One of my oldest friends still recounts with huge amusement the tale of an occasion when she invited my small children to have tea with hers. As she worked full-time, she had gone to enormous trouble to provide some scrumptious goodies from a well known, very upmarket and expensive local French bakery. As usual - my children had been reminded to remember their manners during their visit. When offered a cake - my daughter replied very politely and cautiously - "Oh - no thank you, we don't eat 'bought' cakes"! Bless her - that still makes us all chuckle - aren't children wonderful!! Getting them involved in growing veg is great too - particularly if they're things like peas and strawberries which they really enjoy and can easily grow for themselves. The calabrese 'Green Magic' (Unwins) that I grow is always a big favourite with children - luckily as it's one of the healthiest things they could eat! It's grown really well again in the tunnel as it does every year - the main heads are late this year as it's been a bit colder. They're ready to cut now though. It will come on very well again after cutting as the light improves and will produce lots of small, but very tasty tender shoots for a couple of months before warmer spring weather makes it run to up to flower. I do an autumn sowing every year, and find this variety very reliable. I always cover it at night with a double layer of fleece to protect it from frost and it will go on for ages producing small shoots after the main crop. I really like the flavour of this very productive variety - and I think that the best way to eat it at this time of year is raw with some hummus or an avocado dip which maximises all it's nutrients. It's so crunchy, sweet and delicious when really fresh - far better for you than 'rubbery', several days old, stuff available in shops. Tired because of travelling from Spain or God knows where! Children really love it's sweet flavour. It's important not to overfeed any winter crops with too much rich manure or other feed when planting them in the autumn. In winter there's not enough light for the plants to photosynthesise well enough to turn all the available nitrates into sugars for growth - with the result that they then taste more bitter and are also more disease prone. I'm convinced that's why so many people really hate Brussels sprouts and other winter brassicas - especially as too much fertiliser use can be a particular problem with chemically-grown crops. Thirty-five years ago when my children were small, their friends would eat my cabbages and spinach etc. quite happily. Their mothers were always totally astonished - as they wouldn't eat the chemically grown, shop-bought vegetables which hey were offered at home! In fact that's what got me started on growing organic vegetables commercially. So many of them asked if they could buy my organic produce - which was extremely rare then. I'm convinced that very small children have naturally more discriminating taste buds - perhaps an ancient throwback to when tasting and perhaps spitting out nasty-tasting, potentially poisonous food might have been vital to survival. We really enjoyed the 'Purple Majesty' and 'Violetta' potatoes which I planted in 10lt. pots in early September with our Christmas and New Year meals. They added a lot of colour, phytonutrients and wonderful flavour. Their siblings, along with several other varieties that I saved for planting this Jan and spring are already raring to go - with lovely sprouts on. Several people have told me Purple Majesty seems to be quite difficult to get as seed tubers at the moment.Luckily I always save the most perfect potatoes from my own crops as my own seed for planting the following year. I've been saving them for several years now, originally from potatoes I bought in a supermarket. It's quite legal to do this as long as you don't sell the seed, and it's a great way to pick up new varieties! This avoids possibly bring in diseases and there's also apparently some evidence that they may acclimatise to your particular garden after a couple of years. You should only ever save the very cleanest, most blemish-free seed from the healthiest plants for doing this. I'll be planting some of these and several other earlier cropping varieties in the middle of this month in 2lt. pots, for planting out later in the tunnel. This ensures that I always have some delicious 'extra early potatoes for Easter - whenever that comes in the calendar! The terrific thing about a tunnel or greenhouse is that it allows you to experiment with many crops that would never do well outside in our climate - and there are also plenty of crops normally grown outdoors here in winter that are so much more productive under cover. Swiss chard and kale are very good examples - and also crops that are never much good outside in average summers here. Melons for example will revel in the tunnel's humid summer warmth and can be really productive. There are far more varieties available now than there were a few years ago. There seem to be a lot more varieties of lettuce suitable for winter growing too - I'm going to trial a few more this year - mostly loose leaf 'picking' varieties as these are the most valuable - giving such a long period of cropping. Although they're as tough as old boots and can recover completely from being frozen to a crisp - endives really enjoy the indoor life too. They're more disease-resistant than most winter lettuce and the slugs don't seem to like them quite as much either - which is useful. I discovered a nice pale leaved one a few years ago called 'White Curled'. It isn't as bitter as the normal types which I normally blanch for a week or so before picking. 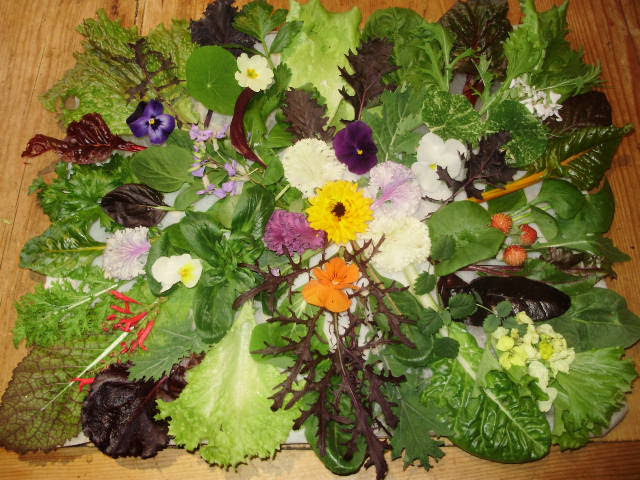 I pick individual leaves of 'White Curled' all winter long - they're very decorative in a mixed salad - making a nice contrast with their pretty, finely cut leaves of pale lemony-green. I originally got it from Simpson's seeds but as it's what's known as an 'open-pollinated variety - not an 'F1' hybrid - I save my own seed now every couple of years which saves money too. I mark the best plant for later on, then in spring I'll let it flower. The bees absolutely adore it so they pollinate it for me and then it sets seed. That keeps both the bees and me happy - a double whammy! Use it or lose it! Making use of every inch of soil is what Nature does! 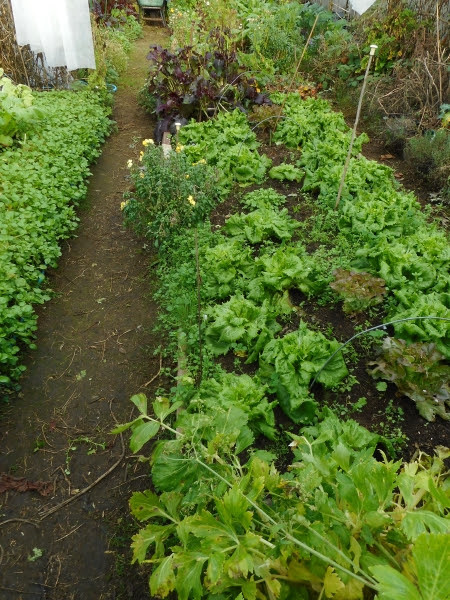 'Inter-cropping' - or growing fast-growing crops between slower maturing crops is something I've always done since I first started gardening in a tiny space 40 years ago. It's the way to make best possible use of every inch of any space. To me it's always seemed common sense that here's no point in leaving ground bare between rows of slower growing things and just hoeing or weeding, if some useful and edible could be growing there! If there isn't room for something to grow, or it doesn't fit into your rotation - which is very important - then an organic mulch is always a good idea. Soil should never be left bare. If you observe nature you'll see that it always populates ground with something - often what us gardeners tend to think of as weeds!. Bare soil is only natural at times in a desert - but even that isn't really bare - it's full of indigenous plant seeds just waiting for some precious rain so that they can spring to life again. Soil should be covered with something all the time, to prevent erosion, loss of carbon, minerals and nutrients. Covering soil with an organic mulch also feeds soil life like worms and protects the microbial life which makes humus. So my gut feeling was right! Someone who has been reading my blog for a while did a Twitter survey a while ago to see how many people covered their soil in winter. I was astonished to see how many still cling to the old way of leaving soil completely bare over the winter, so that the surface is broken up to a fine tilth (to use the old expression) by frost. Before the advent of soil-damaging chemical fertilisers in the early 20th century - you could get away with doing do this as soil was then still full of humus which literally 'glues' the soil particles together - and which had built up millennia - first by the actions of Nature and later by gardeners adding manure and composts to soils in order to fertilise crops. With climate change bringing more extremes of weather - it's now neither sensible nor environmentally acceptable to do this. Soil MUST be protected - it is a valuable resource and if it's left open to the weather in winter - it can literally just wash away carrying most of it's nutrients. Failing a green manure or existing over-wintering crops to protect it's surface and retain nutrients - a good organic mulch even covered with old cardboard, carpet or polythene is better than nothing and will stop rain washing through it! But NEVER leave compost, or manure-covered ground open to the weather either - that's worse than covering it with nothing. It doesn't just lose valuable nutrients but it causes serious pollution of groundwater too! As I'm always saying - it doesn't matter that the ground may later produce very good crops. That is a selfish point of view and is only proof that far too much was probably put on the ground in the first place - since much of the nutrients would have been completely washed away! Here endeth another manure rant! In my garden I often tend to go one step even further than 'inter-cropping' by doing what I call 'continuous layered cropping'. This means constantly overlapping crops - which can get pretty hectic at times! Maybe it should be called 'extreme inter-cropping' instead! Some people have now named this type of gardening 'polyculture'. A very neat new name for an old practice which many of the old self-sufficient cottage gardeners always did! I started doing this when I only had a tiny garden over 40 years ago - but even though I now have plenty of space, I still do it because plants seem much happier growing that way, as long as they have enough air circulation to avoid diseases - and to me it has always just seemed a far more natural way to grow. After all - Nature does it all the time. You need to plan well in advance for this type of cropping though. You also to know roughly how long each crop takes to grow and importantly - how much room it will need as it grows. Whether it needs full sun or won't mind a bit of shade. You have to be extremely careful with watering and ventilation with close cropping too, in order to avoid disease, particularly under cover in a polytunnel or cold frame where there's less air circulation. You also need to keep an eye out for any slugs which may be lurking around with all the extra shelter! If you're not careful with this kind of snug-fit gardening - you can end up with the green 'mess' similar to many 'so-called' permaculture gardens I've seen. Nature loves messy gardens which is good I'll grant you - but they don't produce much in the way of crops and surely that's the point? It's fun sometimes pushing the limits a bit - it's something I've always liked to do with my gardening. You learn a lot by trying different things and every garden is different. I'm constantly experimenting - it's fun. As I've mentioned - planning well really is of the essence. 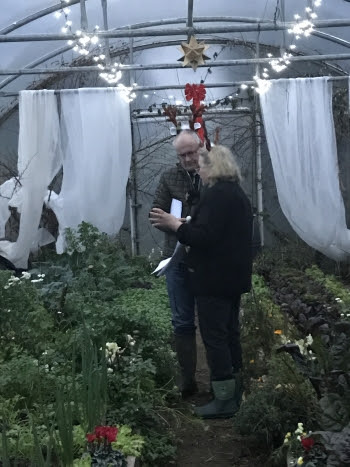 That's why sitting in your polytunnel, having a good look around and making notes can be really valuable at this time of year, when there's not too much urgent work to do. When growth really starts to take off again and you're busy sowing seeds etc - you don't want to waste time wondering exactly where you were going to plant things - or perhaps waste plants because you've got no room to plant them! Although I must say there's always a queue of grateful recipients for any of my spare plants! There really is no excuse not to have a good range of winter salads in your tunnel or greenhouse, or even under large cloches if you plan well and grow the right things. There's more choice than ever in the catalogues now. A tunnel allows you to extend the seasons at both ends if you plan really well - and I'll be sowing some sugar pea 'Delikett' next week. We'll be eating them at the end of April with our extra-early new potatoes - in what people still call the 'Hungry Gap'. There's never hungry gap here though thanks to polytunnels! In the next couple of weeks I'll also be sowing lettuce, carrots, beetroot, turnips and spinach in modules as well as planting some of those 'extra earlies' in pots. The 2nd early/early maincrops Violetta and Purple Emperor did really well early in the tunnel again last year - so I shall definitely be planting some of those too. All the seeds I sow will be germinated in the house in the warm (at room temp.- around 60degF/16degC-ish) - then put out onto the roll-out heated mat on the tunnel staging, which gives a low bottom warmth - just enough to keep them frost-free and growing. The potatoes will also be started off in the house and then go out into the tunnel when they appear above the compost, as they'll need light then too - but if very cold weather is forecast they'll all be covered with at least a double layer of fleece for extra protection. When it comes to extending the autumn season it obviously works in reverse - things that would normally stop growing in early October outside will go on for weeks or even months longer during a mild winter under cover. A good example is the late crop of self-blanching celery I always sow in May. Planted out between the early sweetcorn - it crops well through most winters - crisp, juicy and delicious. When the sweet corn is finished it's cut down to the base - rather than pulling it up and disturbing the celery - which would make it run up to seed. Then land cress is planted between the celery. The middle row of celery is cut first - by Christmas - which allows the land cress more light. When it perks up it gives a useful crop from otherwise empty space before the entire bed is cleared. I sowed some home-saved seed of 'Crimson Flowered' broad bean last night - 3 to a recycled 500ml yogurt pot - and as soon as they're up they'll go out into the tunnel - again covering with fleece if a hard frost is forecast. I don't bother sowing broad beans outside in November any more as I find that those sown now will crop just as soon - and often far better. I've been saving my own seed of this beautiful and tasty variety for over 30 years now, always selecting the tallest, heaviest-cropping plants to save from, as originally it was quite short. Mine reach about 5 feet high now!. I got it originally from the Heritage Seed Library of the HDRA (now Garden Organic). Following on again from those will be brassicas (cabbage) family next autumn/winter - probably late calabrese (Italian broccoli) and kales. They make use of the 'free' atmospheric nitrogen the legumes will have fixed while growing. An example of Nature's wonderfully designed symbiosis at work! As I've so often said everything is connected - that's how Nature designed it - but we humans so often arrogantly assume that we know better! Current scientific studies - initiated by worries about the decreasing resilience of soils due to the extreme weather effects of climate change - are proving that the more diverse the crops you grow together - then the more diverse the rooting habits of plants are. This in turn also encourages a more diverse soil ecology and so naturally the health of our crops will be better. Chemical farming feeds the soil on 'junk food' - and that makes it just as unhealthy as a diet of junk food does us humans! An organically-fed, carbon and microbially-rich living soil is far healthier and more resilient. It physically insulates and 'cushions' the plant roots against both flooding and drought - and also gives the plants all the things they need to produce the compounds they need to protect themselves against pests and diseases. All successful ancient civilisations knew this, and really understood the value of a healthy soil without the advantages of microscopy that we have now! Taking that into consideration then - another thing that you need to plan really well is rotations. You may not think so - but a well-planned rotation is just as important undercover as outside - perhaps even more so. If you don't plan proper rotations - soil-borne diseases or pests like eelworm, harmful nematodes and depletion of certain nutrients can very quickly build up. I know it's difficult to stick to a four-course rotation in a polytunnel or greenhouse - but I find it easier by dividing up my large tunnel up so that I grow the 4 main plant families in 8 beds. These are raised by using 7in/18cm.planks which save my back too! 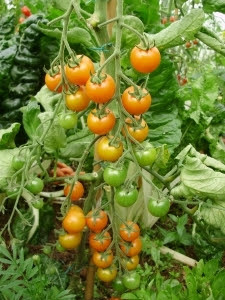 A big problem in tunnels is that there are so many of the Solanaceae (tomato family) that we all want to grow. Aubergines, tomatoes, peppers, chillies and potatoes are all the same family - far too many to grow in just the two designated Solanaceae beds in my tunnel in any one year. One of the ways I get round this is to grow quite a few of that family in large containers like 10 litre recycled mayo or coleslaw buckets - as I've mentioned before. The deli counter at your local shop will have loads which they will be only too happy to give you - as they have to find space to store them until they can be taken off for recycling. They will literally last for years if you store them away from light when you're not using them for growing in - otherwise they become brittle quickly. They will save you a fortune - and really extend the range of things you can grow successfully! Peppers and aubergines in particular are perfectly happy in these, also some of the smaller bush varieties of tomatoes like 'Maskota' are much better behaved in large pots (and also well away from marauding slugs on the ground). Although the bigger cordon varieties will produce quite a good crop in containers and did very well in 2012, 2013 and 2016 when I was growing a lot for the Tomato Festival. In pots they were actually earlier cropping than those in the ground. They generally prefer a bigger root run though, so they need plenty of TLC and careful watering in pots. Larger pots can also be bought at many farm supply shops who sell commercial horticultural needs - these arealways far cheaper than in any DIY multiples! This year I'll be growing my usual 'Rosada F1', 'John Baer', 'Sungold F1', Maskotka and Pantano Romanesco. I shall also be growing the best of the new ones I've discovered in the last couple of years - like Blush and Moonglow. I won't be growing so many (46+) varieties again for a very long time though - it was a bit too much work - even for a tomatoholic like me! I did discover some very useful and tasty new varieties though - which I talk about in my 'Tomato Report 2017' elsewhere. (which by the way I didn't update in 2018 as I had nothing useful to add! - The one tomato, Cupido from Simpsons, which was even approaching the wonderful Rosada is not available either this year - so it would have been pretty pointless!) As every year is different - varieties can vary quite a bit from year to year in performance - but if they don't have a really good flavour, or seem much more prone to disease than everything else - then they don't even get a second chance! One thing is for sure though - and that is that our summers are becoming far less predictable. The tomatoes pictured below are certainly two that I would never be without, and are definitely still my yardstick for flavour. Talking of growing in pots reminds me that it's time to bring in the early strawberries in pots now. Last year I potted runners into 2 litre pots as usual and they've spent the winter outside for a good chill. The variety I grow - 'Christine' - is the best flavoured early for forcing in pots and always fruits by my birthday in mid-May or even earlier which is a real treat (of course I'm a food-loving Taurean - surely you could tell - Taurus is an Earth sign!) Christine is really the most reliable early variety - it's also incredibly vigorous and make loads of runners to give to friends, which are always welcome. I also grew the 'ever-bearing' or remontant variety 'Albion' for the first time in large 10 litre pots a few years ago and it fruited for months, enjoying a feed of my usual 'Osmo' organic tomato feed every couple of weeks. It also has a really terrific flavour and even freezes well without completely collapsing on defrosting. If you have empty ground where you've just cleared a crop, then you can get ahead with lightly raking in some nice well-rotted compost so that you have that ground ready for early plantings. 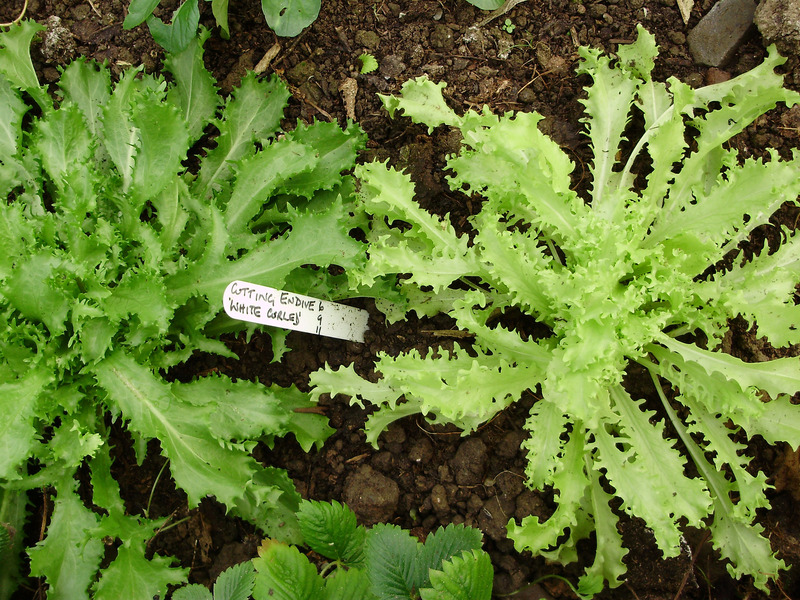 You could possibly even sow some quick growing salad or oriental salad mixes in situ if they fit into your rotation.Or you could sow now into modules which would be even quicker- a small pinch into each - and plant them out in a few weeks. That would give you some early salads. If you live in a milder part of the country or we have a mild spell you could be eating baby leaves in as little as 6 - 8 weeks! As the weather warms up they will start to flower and go to seed - March days can be surprisingly warm in a tunnel when the sun is full out - but then you can leave a few to flower for early bees and dig the rest in as a green manure! The worms will love you as they'll just be really waking up then and very hungry! By the way - if you also leave some of the fast-growing oriental salad mixes to flower - they will attract in grateful early, nectar seeking, beneficial insects like hoverflies and bees. 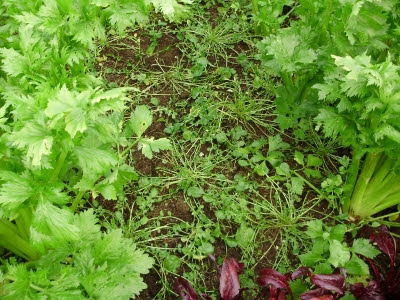 It might even be worth sowing a quick growing green manure crop like mustard if it fits into your rotation - it will germinate at around 45deg.F/.7deg.C. In late autumn or early March. 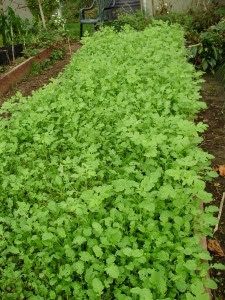 I usually sow the green manure mustard 'Caliente' in one of the beds where I will be growing tomatoes the following summer. 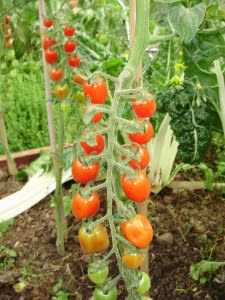 It makes a good bulk to chop up and fork in for the worms to work on before planting the tomatoes in early May. 'Caliente' is a new breed of mustard that acts as a 'biofumugant' - releasing phytochemical gases which clean up any problems in the soil and also encourages good bacteria and beneficial nematodes to multiply. You do need to fork it into the soil as soon as possible after chopping up though - to get the full benefit of it's bio-fumigant properties - or they may evaporate and be lost into the air. Covering the area temporarily with polythene also helps the process by capturing the gases too so that they condense and fall back and also has the effect of warming the soil. Last year it certainly encouraged centipedes - I've never seen so many scampering away when I lifted the cover off the bed to see how things were going - and the worms loved it too! In my old tunnel down at the far end of the garden the soil had become quite 'tomato sick' after many years of tomato crops, despite careful 4 year rotations - the only option until now was to remove all the old soil and replace it with fresh - which the old kitchen gardeners would do. This year I shall sow some 'Caliente' there in early spring and then not grow any tomato family there for a few years - hoping it will recover. I don't much fancy changing the soil in a large tunnel to a depth of 1/2 a metre - the only other alternative to growing in containers - since I can't move the tunnel! I may rear a few broiler chickens in there after that - as I did years ago. They really love it in the dry and warm environment of a tunnel and enjoy scratching around in there - as long as I can keep out foxes! Get your worms working for you! If you're clever and look after them well - worms will do most of the work for you by breaking down and processing green manures and compost after you add them to your soil, enriching it with their worm casts at the same time! Worm casts are actually many times more nutritious than normal garden compost - they can be up to 10 times higher in potash, phosphorus and many other nutrients, so it's worth having a worm bin as well as a normal compost heap or bin. In fact, I would almost go so far as to say it's more useful than a large compost bin - particularly in small gardens where space is at a premium. Worm compost is the most fantastic tonic - it's like rocket fuel for plants! I have huge respect for worms - many people don't realise just how vital they are - and how hard they're always working 24/7 behind the scenes in our gardens even at night! Contrary to what most people think - worms like green food to eat - not just rotted compost. One evening this was amply demonstrated to me when I was out at dusk in a nearly dark tunnel picking a salad for supper by torchlight. Just as I was bending down to pick some leaves a movement in the furthest corner of my eye caught my attention. For a split second I wondered what it was - then I moved the torch just in time to see a worm disappearing backwards fast down into it's burrow, firmly grasping a piece of partially decayed claytonia leaf, which it pulled underground in record time! Absolute magic! I've never actually seen that happen in front of my eyes before! One of the wonders of Nature only seen by the very observant few like Darwin - or the very lucky like me! Even more reason to feel sorry when I cut one in half with the spade - I always apologise! Funny how doing the same to slugs really doesn't bother me one little bit! It's been so grey and damp on many days for the last few weeks that said slugs have cheekily been out quite shamelessly in broad daylight - if you could call it that! I've been patrolling the tunnel with the scissors whenever I feel like a break from being inside at the computer because I don't want them building up - which they certainly will if left to carry on undisturbed. It's very therapeutic! As there's also quite a bit of botrytis, or grey mould starting to happen now with all the cold damp weather - diligent housekeeping is vitally necessary. Remove any mouldy or dying leaves immediately! The polytunnel is the only place in the garden in which to be comfortable right now. I try to spend some time in there every day just tidying, sorting pots etc. Putting time into odd jobs in the tunnel now while we can before things get busy again also pays off hugely later! Sometimes I just sit in there to get my daily dose of light. Yesterday as I sat in there quietly for a while I watched the sparrows, wrens and robins hunting insects in there and a thrush and a whole 'charm' of godfinches were singing beautifully up in the hedge just north of the polytunnel. It was absolute bliss! I wouldn't be without my tunnels for anything! January is such a hopeful time of year. Lots of plans to make and new things to look forward to! I'm so grateful for my polytunnels! In the future they may well be the only way to grow food crops in many parts of the world with increasingly wet conditions cause by climate change. Severe storms have been a huge problem several times over the autumn and winter so far, with me often having to shut the doors after only a couple of hour's ventilation in the mornings. Winds gusting around unpredictably can make life difficult here on top of our hill, as we're quite high up - and as the crow flies only about 5 miles from the sea. A few days ago I went up to close the tunnel doors as it was getting too gusty to be safe, only to discover that an enterprising pheasant had somehow neatly slipped through a gap in the netting at the top end and was just starting to investigate! Caught just in the nick of time!! He naturally panicked as soon as he saw me and started to fly at the sides of the tunnel like a bomb exploding - I was terrified that he would go through the polythene. Luckily, I managed to pin up the net at the top end - I walked around the outside down to the bottom end, going in through that door, so he then ran out of the top end door without any damage. - Major sigh of relief!! I have to say that I am grateful to him though - because as I replaced the net again - more securely this time - my eye was caught by lots of little holes in the polythene in the arch over the top of the door where insects always tend to get trapped in the summer. Almost as if someone had stubbed cigarettes out in a row - making a perforated line all along the polythene beside the end hoop. Having watched sparrows last summer in the other tunnel launching themselves from the top of the sliding door in order to catch insects, I realised immediately what caused the holes! The little dears! I'm now sitting here praying that the wind does no damage and that I can recruit some less accident-prone help to put some tunnel tape all along the hoops at both ends where they have pecked the holes. Going up a ladder with only one half good arm would not be a good idea for me! Sadly there are now times when even I have to admit that there are some things that I can't do without help! Particularly since breaking my right shoulder badly two years ago. I think I should be called the one-armed gardener now! The last thing I need is a pheasant gobbling up everything - the tunnel unzipping itself - or me having another accident like the one I had 4 years ago when tripping over a bramble on the way up to feed my hens!! My name should really be Calamity Jane!